am eigenen Leib konnte ich erfahren wie es sich anfühlt, plötzlich nicht mehr alle Freiheiten zu haben. 5 Tage verbrachte ich nach einem Suizidversuch in der geschlossenen Station. Das und die Erkenntnis, ein Verschweigen der Krankheit mich erst dahin geführt hatte, nahm ich zum Anlass, mich zu outen und offen über meine psychische Krankheit zu sprechen. 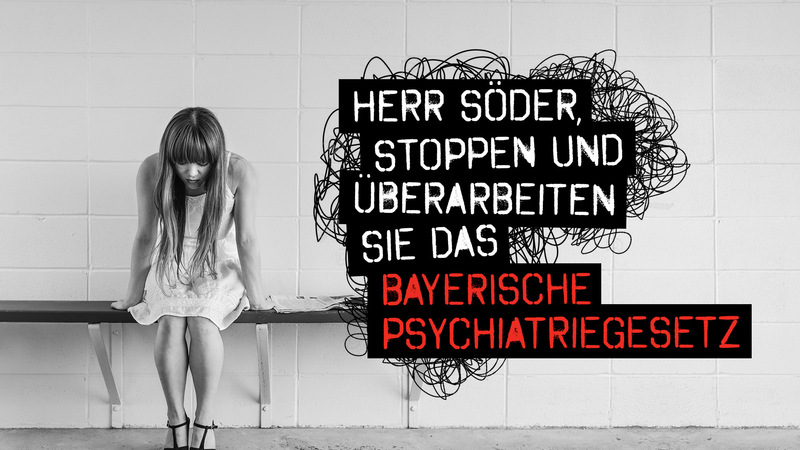 Mein Name ist Uwe Hauck und auf Change.org protestiere ich gegen das geplante Bayerische Psychiatriegesetz! Ministerpräsident Markus Söder muss den Entwurf stoppen und anpassen. Der Entwurf für das Gesetz macht mich fassungslos. Patienten sollen bei der Polizei gemeldet und Daten fünf Jahre gespeichert werden. Listen von psychisch Kranken zu erstellen und über Jahre den Behörden zur Verfügung zu stellen, stigmatisiert bereits geheilte und entlassene Patienten noch zusätzlich und stellt eine massive Einschränkung im Bezug auf den weiteren Alltag dar. The Supreme Court has granted immunity to a police officer who shot a mentally ill woman outside her home. Justice Sonia Sotomayor said the decision keeps with a “disturbing trend” of the high court shielding serious police misconduct. The case was occasioned in 2010 when a University of Arizona police officer responded to a call of a woman brandishing a knife. The U.S. Supreme Court Monday granted immunity to a police officer who shot a mentally ill woman outside her home in 2010, prompting a fervent dissent from Justice Sonia Sotomayor. The justice said Monday’s decision keeps with a “disturbing trend” in which the high court continuously shields serious police misconduct from civil liability. The case was occasioned in 2010 when University of Arizona police officer Andrew Kisela responded to a “check welfare” call, after a neighbor called 911 to report a woman brandishing a knife was behaving erratically and hacking at a tree. Kisela and two other officers arrived at the scene to find the woman, Amy Hughes, emerging from her home with a knife in her hand. She was approaching her roommate, Sharon Chadwick, who was standing in the driveway. Accounts differ as to the events that immediately followed, but the confrontation concluded with Kisela shooting Hughes four times. Hughes has a history of mental illness, of which the officers on scene were unaware. Hughes claimed the shooting violated the Constitution, and she sued Kisela for damages. The 9th U.S. Circuit Court of Appeals found in her favor, prompting Kisela’s appeal to the Supreme Court. In an unsigned opinion, the high court reversed the 9th Circuit’s decision without briefing or argument. This practice, known as summary reversal, is generally reserved for clear errors of law. The Court found Kisela was entitled to qualified immunity, which protects police officers from civil damages provided the conduct at issue does not violate a clearly-established right. This requires courts to determine whether a “reasonable officer” would have known the relevant actions were unlawful. In finding for the officer, the Court emphasized the quick time frame in which events unfolded, as well as the fact that Hughes was standing in immediate proximity to a defenseless civilian. They also noted the 9th Circuit sanctioned a police shooting in a similar case, in which officers fired on a non-compliant man carrying a sword near the entrance to a private residence. Sotomayor dissented from the decision, joined by Justice Ruth Bader Ginsburg. While arguing the majority misapprehends the case’s facts and the relevant law, she went on to criticize her colleagues for their one-sided enforcement of the qualified immunity rule. Though the justices often reverse lower courts who mistakenly deny officers immunity, they almost never intervene to correct a lower court that wrongly awarded it. “This Court routinely displays an unflinching willingness ‘to summarily reverse courts for wrongly denying officers the protection of qualified immunity’ but ‘rarely intervenes where courts wrongly afford officers the benefit of qualified immunity in these same cases,’” she wrote. “Such a one-sided approach to qualified immunity transforms the doctrine into an absolute shield for law enforcement officers, gutting the deterrent effect of the Fourth Amendment,” she added. Justice Clarence Thomas has criticized the doctrine on slightly different grounds. He argued modern qualified immunity cases are increasingly divorced from their historical roots in a 2017 opinion. Writing at the Volokh Conspiracy after Monday’s decision, University of Chicago Law School professor Will Baude noted the Court’s vigorous defense of qualified immunity is somewhat unusual. Most police shooting cases are intensely subjective and fact-specific, where the Supreme Court’s primary task is to craft general rules dictating the resolution of many different cases. Baude’s scholarship was cited in Sotomayor’s dissent.